Evaristo News - Six Lucas Video Award Nominations! Evaristo’s video for ‘Siempre que llueve…’ (After the Rain), featuring Telmary Diaz, has been nominated by Cuba’s famous ‘Lucas’ Awards for both Best Video of the Year and Best Music Fusion Video, as well as being nominated in the Best Director, Best Art Direction, and Best Director of Photography categories. In addition, a clip about the making of Evaristo’s video was nominated in the Best ‘Making Of’ category. 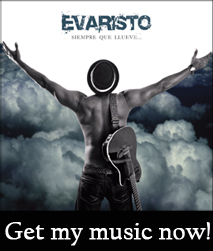 Evaristo’s video can be seen on YouTube.com (search "Evaristo featuring Telmary"), or on our Multimedia page. The video was filmed in Havana, Cuba and is directed by Tomas Miña. Evaristo competes for best video with such artists as Charanga Habanera. As part of the Lucas Festival 2009, the nominated videos will be playing at locations throughout Havana in November, including the Parqueo de Coopelia, the Parque de Los Artesanos, and the Centro Fresa y Chocolate. The nominees for the Lucas Awards of 2009 were announced Wednesday October 21 at the Tropicana nightclub in Havana. The Lucas Awards honor Cuban music videos in a variety of categories, and will be announced on TV Cubana from Havana’s Karl Marx Theatre. See "Nominados Premios Lucas 2009" (www.juventudrebelde.cu/cultura/2009-10-24/revelan-nominados-a-premios-lucas-2009) for more information (site in Spanish), or contact us at evysaoco@hotmail.com.